In Japan, governmental support for human papillomavirus (HPV) vaccination began in November 2010 for girls aged 12-16 years. However, Japanese media started to report negatively on HPV vaccination due to problems such as chronic pain, and the proactive recommendation for vaccination was suspended in June 2013 (Morimoto et al. 2015; Ueda et al. 2015; Hanley et al. 2015; Tanaka et al. 2017). The Vaccine Adverse Review Committee of the Japanese Ministry of Health, Labour, and Welfare (MHLW) investigated adverse events in about 8,898,000 injections from 2010 to 2013. Among 2,475 adverse events, there were 617 (6.9/100,000) severe cases and 176 (2.0/100,000) cases with chronic pain. The adverse events of chronic pain were mainly functional disorders, rather than organic disorders. To date, the Japanese Government has not reinstated a proactive recommendation for use of HPV vaccine. The risks of the vaccine are easily understood, whereas the merits of the vaccine are not easily understood. We reported the effects of HPV vaccine in Miyagi by investigating vaccination rates and the incidence of abnormal cytology in the fiscal year (FY) 2014. However, because of the limited number of the enrolled women, the effects of vaccine were not conclusive (Ozawa et al. 2016). Therefore, we examined the effects of HPV vaccine in Miyagi by investigating the incidence of abnormal cytology and histology in FY 2014-2015. The subjects were women aged 20 to 24 years who underwent uterine cervical cancer screening in Miyagi Prefecture in FY 2014-2015 (April 2014-March 2016). We asked each subject to report her history of vaccination in a questionnaire. Cervical cytology, histology and history of vaccination were examined using data of the Miyagi Cancer Society. Statistical analysis was performed by χ2 test. Cytological evaluation was performed by the conventional method in about 70% of cases and using liquid based cytology in about 30% in Miyagi. This study and questionnaire were discussed by the Gynecological Exam Committee of Miyagi Cancer Society and were approved by individual municipal governments. The study was approved by the ethics committee of Miyagi Cancer Society (approved number 1508). There were 6,462 women aged 20 to 24 years who underwent uterine cervical cancer screening in Miyagi Prefecture in FY 2014-2015 (April 2014-March 2016). The attendance rates for cervical cancer screening are very low, especially among women aged 20-24 years old. Most cites in Miyagi support young women financially so that they can undergo cervical cancer screening in any year. There were 538 women who underwent cervical cancer screening in both FY 2014 and 2015. In this study, we analyzed 5,924 women among a total 6,462 women, with exclusion of the 538 women, to examine the rate of vaccination based on data per person. There were 1,002 (16.9%) women who had received HPV vaccination among the 5,924 women. Importantly, there were no adverse events, such as chronic pain, among 1,002 women who were vaccinated in Miyagi. In FY 2014, the overall vaccination rate was 10.08% (331/3,283) for women aged 20 to 24 years old, and the rates of vaccination were 42.26%, 9.71%, 14.60%, 3.82%, and 4.00% in those aged 20, 21, 22, 23, and 24 years old, respectively (Table 1). The rates in FY 2014 were recalculated from the data published in the earlier report (Ozawa et al. 2016). In FY 2015, the overall vaccination rate was 25.41% for women aged 20 to 24 years old, and the rates of vaccination were 59.26%, 49.68%, 11.97%, 9.08%, and 4.58% in those aged 20, 21, 22, 23, and 24 years old, respectively, with the exclusion of the 538 women (Table 1). The vaccination rates based on year of birth were calculated as follows; the sum of cases of 20 y.o. in FY 2014 and cases of 21 y.o. in FY 2015 were supposed to be cases in FY 1994-93 birth. Among the 5,924 women, the rates of vaccination were 59.26%, 47.80%, 10.40%, 11.02%, 4.14%, and 4.00% in women born in FY 1995-94, 1994-93, 1993-92, 1992-91, 1991-90 and 1990-89, respectively (Table 2). In cytology, the rates of atypical squamous cells of undetermined significance (ASC-US) or worse were 1.90% (19/1,002) in women with HPV vaccination and 5.49% (270/4,922) in those without HPV vaccination. The reduction rate was 65.39%. This reduction rate was calculated as (5.49-1.90)/5.49 × 100% (Table 3). Comparison of ASC-US or worse and NILM indicates that vaccination resulted in a significant decrease in the rate of ASC-US or worse (P < 0.0001) (Table 4). The rates of high-grade squamous intraepithelial lesion (HSIL) or worse were 0.20% (2/1,002) in women with vaccination and 1.14% (56/4,922) in those without vaccination. The reduction rate was 82.46%. This reduction rate was calculated as (1.14-0.20)/1.14 × 100% (Table 5). We compared HISL or wore cases and LSIL or better cases which included NILM, ASC-US, atypical squamous cells, cannot exclude HSIL (ASC-H), and LSIL. Comparison of HSIL or worse and LSIL or better indicates that vaccination resulted in a significant decrease in the rate of HSIL or worse (P < 0.0001) (Table 6). In histology, there were 7 cases of cervical intraepithelial neoplasia 1 (CIN1) and 1 case of CIN2 among women with vaccination. There were 78 cases of CIN1, 25 cases CIN2, and 9 cases CIN3+ among women without vaccination. Unknown cases include ASC-US cases with HPV negative (Table 7). The rates of CIN1+ were 0.80% (8/1,002) in women with vaccination and 2.28% (112/4,922) in those without vaccination. The reduction rates of CIN1+ was 64.91% (P = 0.0025). This reduction rate was calculated as (2.28-0.80)/2.28 × 100%. The rates of CIN2+ were 0.10% (1/1,002) with vaccination and 0.69% (34/4,922) without vaccination. The reduction rates of CIN2+ was 85.51% (P = 0.0261). This reduction rate was calculated as (0.69-0.10)/0.69 × 100%. The rates of CIN3+ were 0% (0/1,002) with vaccination and 0.18% (9/4,922) without vaccination. The reduction rates of CIN3+ was 100% (P = 0.3724, Fisher exact test). This reduction rate was calculated as (0.18-0.00)/0.18 × 100% (Table 8). Rates of HPV vaccination among the young women who underwent cervical cancer screening in FY 2014-2015. Cases of 20 y.o. in FY 2014 and cases of 21 y.o. in FY 2015 were supposed to be the same year of birth. The rates of FY 2014 were recalculated from the data published in the earlier report (Ozawa et al. 2016) and are presented for comparison. Rates of HPV vaccination based on year of birth among the young women who underwent cervical cancer screening in FY2014-2015. The sum of cases of 20 y.o. in FY 2014 and cases of 21y.o. in FY 2015 were supposed to be cases in FY 1994-93 birth. The data of FY 2014 were recalculated, based on the earlier report (Ozawa et al. 2016). Rates of ASC-US or worse in women with or without HPV vaccination. ASC-US, atypical squamous cells of undetermined significance. Comparison between ASC-US or worse and NILM in women with or without HPV vaccination. ASC-US, atypical squamous cells of undetermined significance; NILM, negative for intraepithelial lesion or malignancy. ASC-US or worse includes all categories except for NILM. Rates of HSIL or worse in women with or without HPV vaccination. Comparison between HSIL or worse and LSIL or better in women with or without HPV vaccination. *HSIL or worse includes HSIL, squamous cell carcinoma (SCC), adenocarcinoma in situ (AIS), adenocarcinoma and other malignancy. **LSIL or better includes negative for intraepithelial lesion or malignancy (NILM), ASC-US, and atypical squamous cells, cannot exclude HSIL (ASC-H). HSIL, high grade squamous intraepithelial lesion; LSIL, low grade squamous intraepithelial lesion. Histology in women with or without HPV vaccination. *Unknown cases includes ASC-US cases with HPV negative. Comparison of histology between women with and without HPV vaccination. 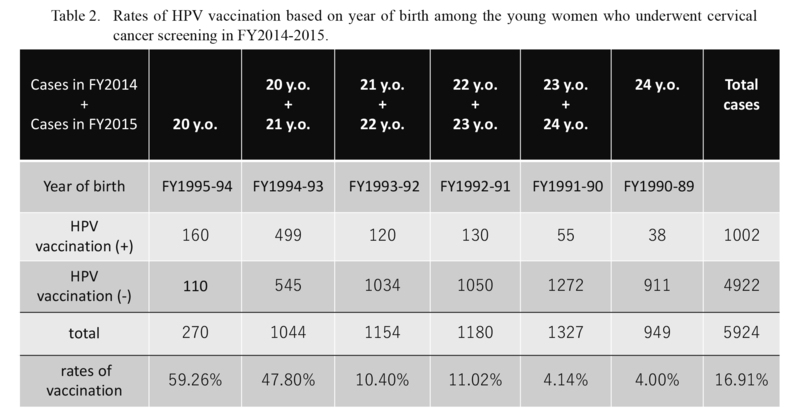 The vaccination rates were 47.80% and 59.26% in women born in FY 1993-94 and 1994-95, respectively, in Miyagi. The Japanese MHLW reported the vaccination rates of national immunization programme increased as follows, 42.2%, 54.2%, 81.1%, and 81.2% in women born in FY 1994, 1995, 1996, and 1997, respectively. But the vaccination rates decreased as follows: 75.3%, 74.2%, 42,9%, 6.1%, 0.7%, and 0.1% in women born in FY 1998, 1999, 2000, 2001, 2002, and 2003, respectively (Sobue 2016). Further follow-up of HPV vaccination and cervical abnormalities is needed in Japan. The results showed that the rates of ASC-US or worse decreased by 65.39% and the rates of HSIL or worse decreased by 82.46% in women who had undergone HPV vaccination. The rates of CIN1+ were decreased by 64.91% and the rates of CIN2+ were decreased by 85.51%. Our data are the first to demonstrate a significant decrease of CIN2+ cases in an Asian population. Several clinical trials have shown the effects of quadrivalent HPV vaccine (Future II Study Group 2007) and bivalent HPV vaccine (Paavonen et al. 2009). A study in Australia (Crowe et al. 2014) showed a 43% decrease of atypical cells and a 62% decrease of HSIL in women aged 22-25 years with three vaccinations (after a lapse of 7 years). Similarly, a report in Denmark (Baldur-Felskov et al. 2014) on uterine cervical cancer screening for women aged 20-21 years showed that atypical cells, CIN2 and CIN3 decreased by about 60%, 73%, and 80%, respectively. A study in Scotland (Pollock et al. 2014) also showed that CIN3 decreased by about 55% after vaccination. Our data are essentially similar to the findings in Australia, Demark and Scotland. We hope that the Japanese MHLW makes a decision to restart the proactive recommendation for women aged 12-16 years old as soon as possible, based on scientific discussion. We recommend catch-up vaccination for non-vaccinated young women who were born since 2000. We also recommend 9-valent (6, 11, 16, 18, 31, 33, 45, 52, and 58) HPV vaccine which can protect against around 90% of cervical cancer cases. (Joura et al. 2015). HPV16 and 18 are detected in about 65% of cases in Japan. HPV52 and 58 are detected more often in Japan than in Europe in cases of cervical cancer and CIN2-3 (Miura et al. 2006). In 2017, the WHO Global Advisory Committee for Vaccine Safety concluded that the available evidence does not suggest any safety concern regarding the use of HPV vaccines. In 2016, the Vaccine Adverse Effects Review Committee of the Japanese MHLW studied women aged 12-18 years old in terms of symptoms such as chronic pain. The findings showed that 17.5/100,000 had several symptoms within 1 year after HPV vaccination, whereas this rate was 20.4/100,000 for women who did not receive HPV vaccination, with no significant difference between those who did and did not receive HPV vaccination (Sobue 2016). The same committee followed 156 cases of severe adverse events, and found that 73.7% (115/156) of these cases had recovered in 2016. However, despite these findings, there is still a need to establish a system for diagnosis and treatment of patients with adverse events after injection of HPV vaccine. We would like to express our deep gratitude to Mr. Masaaki Otomo, the staff members of the Miyagi Cancer Society and physicians of the Gynecological Exam Committee for their assistance with data collection and analysis. Baldur-Felskov, B., Dehlendorff, C., Munk, C. & Kjaer, S.K. (2014) Early impact of human papillomavirus vaccination on cervical neoplasia: nationwide follow-up of young Danish women. J. Natl. Cancer Inst., 106, djt460. Crowe, E., Pandeya, N., Brotherton, J.M., Dobson, A.J., Kisely, S., Lambert, S.B. & Whiteman, D.C. (2014) Effectiveness of quadrivalent human papillomavirus vaccine for the prevention of cervical abnormalities: case-control study nested within a population based screening programme in Australia. BMJ, 348, g1458. Future II Study Group (2007) Quadrivalent vaccine against human papillomavirus to prevent high-grade cervical lesions. N. Engl. J. Med., 356, 1915-1927. Hanley, S., Yoshioka, E., Ito, Y. & Kishi, R. (2015) HPV vaccination crisis in Japan. Lancet, 385, 2571. Joura, E.A., Giuliano, A.R., Iversen, O.E., Bouchard, C., Mao, C., Mehlsen, J., Moreira, E.D. Jr., Ngan, Y., Petersen, L.K., Lazcano-Ponce, E., Pitisuttithum, P., Restrepo, J.A., Stuart, G., Woelber, L., Yang, Y.C. et al. (2015) A 9-Valent HPV Vaccine against Infection and Intraepithelial Neoplasia in Women. N. Engl. J. Med., 372, 711-723. Miura, S., Matsumoto, K., Oki, A., Satoh, T., Tsunoda, H., Yasugi, T., Taketani, Y. & Yoshikawa, H. (2006) Do we need a different strategy for HPV screening and vaccination in East Asia? Int. J. Cancer, 119, 2713-2715. Morimoto, A., Ueda, Y., Egawa-Takata, T., Yagi, A., Terai, Y., Ohmichi, M., Ichimura, T., Sumi, T., Murata, H., Kanzaki, H., Nakai, H., Mandai, M., Yoshino, K., Fujita, M., Kimura, T., et al. (2015) Effect on HPV vaccination in Japan resulting from news report of adverse events and suspension of governmental recommendation for HPV vaccination. Int. J. Clin. Oncol., 20, 549-555. Ozawa, N., Ito, K., Tase, T., Metoki, H. & Yaegashi, N. (2016) Beneficial effects of human papillomavirus vaccine for prevention of cervical abnormalities in Miyagi, Japan. Tohoku J. Exp. Med., 240, 147-151. Paavonen, J., Naud, P., Salmeron, J., Wheeler, C.M., Chow, S.N., Apter, D., Kitchener, H., Castellsague, X., Teixeira, J.C., Skinner, S.R., Hedrick, J., Jaisamran, U., Limson, G., Garland, S., Szarewski, A., et al. (2009) Efficacy of human papillomavirus (HPV)-16/18 AS04-adjuvanted vaccine against cervical infection and precancer caused by oncogenic HPV types (PATRICIA); final analysis of a double-blind, randomised study in young women. Lancet, 374, 301-314. Pollock, K.G., Kavanagh, K., Potts, A., Love, J., Cuschieri, K., Cubie, H., Robertson, C., Cruickshank, M., Palmer, T.J., Nicoll, S. & Donaghy, M. (2014) Reduction of low- and high-grade cervical abnormalities associated with high uptake of the HPV bivalent vaccine in Scotland. Br. J. Cancer, 111, 1824-1830. Sobue, T. (2016) National epidemiologic research in Japan (in Japanese) 1-12. http://www.mhlw.go.jp/file/05-Shingikai-10601000-Daijinkanboukouseikagakuka-Kouseikagakuka/0000147016.pdf [Accessed: November 10, 2017]. Tanaka, H., Shirasawa, H., Shimizu, D., Sato, N., Ooyama, N., Takahashi, O. & Terada, Y. (2017) Preventive effect of human papillomavirus vaccination on the development of uterine cervical lesions in young Japanese women. J. Obstet. Gynaecol. Res., 43, 1597-1601. Ueda, Y., Enomoto, A., Egawa-Tanaka, T., Morimoto, A. & Kimura, T. (2015) Japan’s failure to vaccinate girls against human papillomavirus. Am. J. Obstet. Gynecol., 212, 405-406.